You know how it goes… it starts out normal with everyone enjoying their lives and going about business as usual. But in the background, there’s some sense of foreboding. Finally the villain or tormentor (in this case China) makes their appearance. Then all hell breaks loose… everything is thrown into chaos and everyone is running for their lives. And while you’re in the thick of the fear and chaos, it’s hard to see how things will play out. Who will be the next casualty? Who will survive? How will it end? The calm and boring summer of range bound trading was broken in an instant. 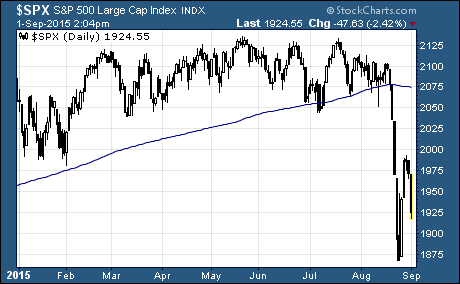 As you can see, the S&P 500 broke through the key technical support level of the 200-day moving average on August 20th. The S&P 500 dropped more than 14% from the recent highs. Then the large cap index promptly rebounded more than 10%. Obviously, that makes perfect sense (yes, that’s sarcasm). 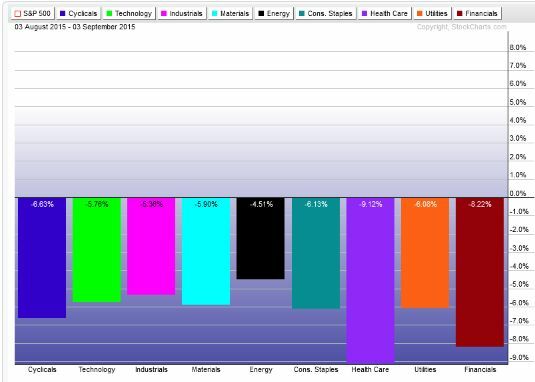 And the selloff hit all sectors of the market. As you can see, there was no place for investors to hide from this pullback. The primary cause of the selloff was China. As we’ve talked about many times before, economic growth in China has been slowing for years. Their latest attempts to prop up economic growth built up a stock market bubble. The air began to leak out of the stock market bubble in June. 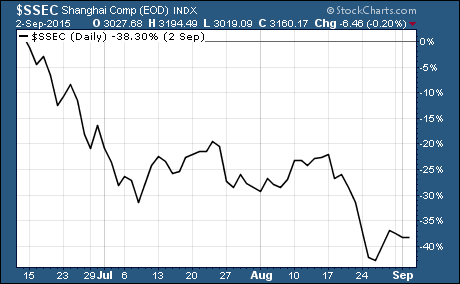 Chinese stocks are now 40% below their peak of just a few months ago. The Chinese government openly admitted they were buying stocks to try to stem the tide of selling. Then China devalued their currency in a surprise move in the week before the US market selloff. Needless to say, these aren’t normal things for the government to be doing. All of the crazy stuff China was doing caused a lot of investors to believe that another shoe was about to drop. It’s hard to say where we go from here. China, oil prices, earnings, and the uncertainty of the first Fed rate hike are weighing on investors. Fear and pessimism are dominating investor decisions these days. At the same time, US economic data is solid with pockets of strength that point to faster economic growth and better days ahead for consumers. One thing’s for sure, the relative calm of the range bound S&P 500 has ended. If these fears and negative sentiment are proven to be unfounded, it could be just the thing to spark the next big move higher for US stocks. However, it’s too soon to say that the S&P 500 has found a bottom. Don’t forget that investors are still focused on the many shortcomings of the market like – falling oil prices, slowing growth in China, strong US Dollar, sluggish corporate investment, and the timing of the first US interest rate hike in nearly a decade. Use this time to build a list of stock you want to own. And when the time is right, be ready to pounce on these stocks.